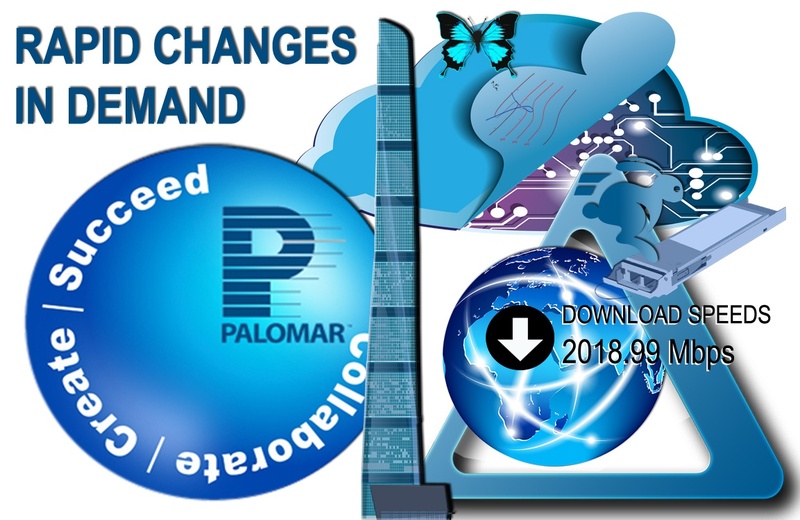 This blog is the second in a series of eight examining Current Trends in the Opto-micro-electronic and RF Packaging Eco-systems giving readers a glimpse of our shared technological future, as well as hints regarding Palomar’s product development roadmap. The views represented are entirely those of Dr. Anthony O’Sullivan of Palomar Technologies. Dr. O’Sullivan will gladly field questions and comments. As a bit of fun, he is interested to know if anyone can explain the significance of the butterfly in the accompanying graphic. Engaging in the development of high-tech products (and their markets) used to be like taking an escalator to reach the desired section, on the correct floor, of a department store. Paced, methodical, strategic and quietly defined. Today, the whole scenario is more akin to taking the elevator in the Shanghai Tower—suddenly you traveling at 20.5 meters per second! A dizzying elevation to the top, but an equally sharp decent to the bottom. Translate our metaphor onto just one of many potential examples in the real world of micro-electronic packaging, and our illustrations find sober, commercial substance. In 2015 analysts were speculating on the length of the demand curve for 10G transceivers, and preparing for the rise of 40G. Less than a year later, a period originally calculated in years was cut to months. Unexpectedly the market skipped a generation and demanded 100G transceivers. Suppliers could barely keep up, leading to huge growth in revenue (and profit) for key manufacturers. Corporations valued in hundreds of millions of dollars in 2014, suddenly found their stock worth billions. What happened to bring about this sudden change? The big datacom companies knew of the 100G technology and simply chose to demand it sooner rather than later. Continuing our earlier metaphor, another “tortoise” that has morphed into a hare is the silicon photonic integrated chip (SiPIC). Analysts anticipate that what is currently a marginal product valued at a few million dollars (2016) will explode to four billion dollars by 2025 ($600 million chip value). Corporate investor information and analyst reports not only supports this interpretation, but suggests that it is perhaps too conservative. Our tortoise-turned-hare metaphor also has application to the world of RF, and RF GaN in particular. Though the latter has many uses, the roll-out of 5G networks is seen by key producers as catalyst portending rapid, exponential growth, dove tailing into several other, new and significant sectors. One report states that of the leading producers, well over three-quarters were preparing for this kind of demand, not least on account of media headlines such as, “Sooner Than We Expected” and “5G Gets Real”. A long list of providers are currently forecasting “wide scale deployment of 5G to start next year”. China Mobile has announced “trials in many major Chinese cities to begin this year” as has AT&T for the USA. Australia, however, will have probably the world’s first nationwide commercial network—in the first half of 2019. We have spoken of the technology, but what exactly is 5G? Most people know that it has a lot to do with speed, so a good question is, “How fast is ‘fast’ ”? Currently, the average download speed of a mobile phone in the USA is 26.32 Mbps. This will compare to between 1 Gbps and 2 Gbps bps with 5G, or 40-100 times faster. If you live in Singapore, however, you may enjoy speeds approach 6Gbps, which is 228 times faster. In other words, what once took four hours to download will be complete in less than 60 seconds. To focus on down-load speeds, however, is to miss the full genius of the technology. Extremely low latency—delay when transmitting—will allow milli-second decisions to be made, for example, by autonomous vehicles. This will yield far higher levels of safety than is possible with a human driver. The same safety features will carry over to the off-site operation of heavy equipment, or other equipment in hazardous situations. Low latency wedded to vast bandwidth will similarly support the use of VR and AR: Remote health care will enable doctors and surgeons to provide essential support in emergency situations. Greater energy efficiency will also allow for vital long-lasting health wearables. 5G will allow for 4K+ HD video conferencing, as well as far superior connectivity when using a phone in a crowd. More could be said about 5G’s value to security and the marked impetus it will give to the development to the IoT including SMART devices. In other words, as we consider the plethora of uses and new devices we are back to our Shanghai elevator: Like the invention of the steam engine in 18th Century England, one fundamental change in technological synergy has opened the flood gates to invention, innovation and radical alterations in work and life-style practices. Not surprisingly this entire dynamic is termed “a fourth industrial revolution” or “Industry 4.0”.